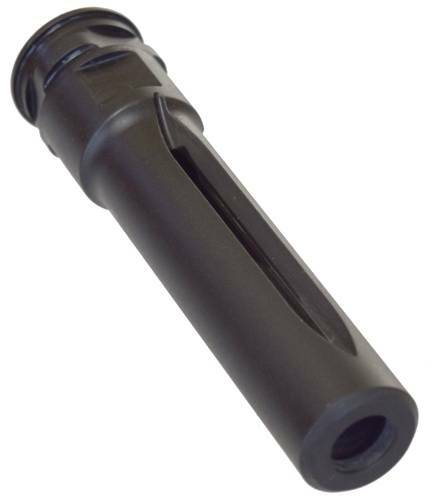 3.875" Long Lug MFI HK G28 DMR Style Muzzle Brake / Barrel Extension for Ca. Compliant: Steyr AUG, MSAR or IWI TAVOR with 18" Barrel or any weapon with 1/2 X 36 thread to get to Ca OAL 30" or MD OAL 29". WARNING: Use only with bullets 9mm or smaller. 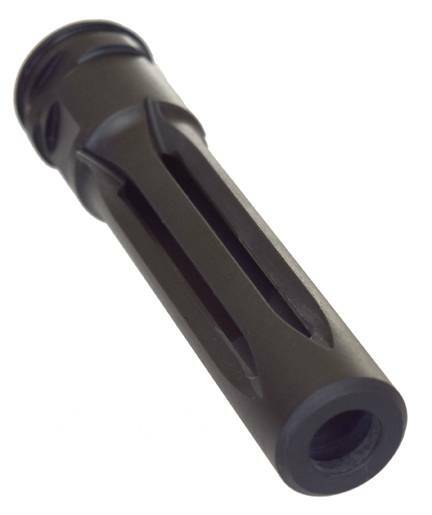 3.875" Long Lug MFI HK G28 DMR Style Muzzle Brake / Barrel Extension for Ca. Compliant: Steyr AUG, MSAR or IWI TAVOR with 18" Barrel or any weapon with 1/2 X 36 thread to get to Ca OAL 30" or MD OAL 29" or a Featureless Ca. Semiautomatic Rifle. WARNING: The Exit Hole necks down to 0.397". Use only with 9mm bullets or smaller. This item will fit ANY BARREL with a 1/2 X 36 Thread. This item fits any weapon with a 1/2 X 36 threads WITHOUT ANY MODIFICATION. You do however need to remove the existing Flash Suppressor / Flash Hider / Muzzle Device.